By Austin Gambino, Marketing Assistant, The Cruise Web, Inc. 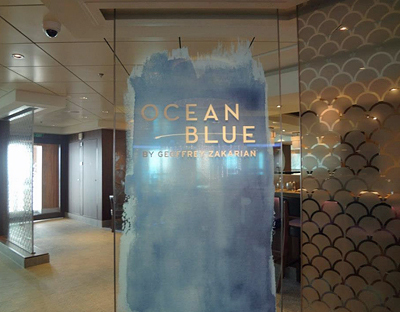 When I realized I was lucky enough to be attending the two-day preview cruise of Norwegian Cruise Line’s Norwegian Breakaway, I knew my first priority was going to be Ocean Blue, Geoffrey Zakarian’s newest restaurant. For those of you who live under a rock, Geoffrey Zakarian is a Food Network Star and restaurateur, boasting culinary establishments in the likes of Atlantic City (The Water Club), New York City (The Lambs Club), and now on the Norwegian Breakaway. He even mentioned at the Norwegian Breakaway christening that he trained the kitchen staff himself. It was well-known that it would be difficult to secure reservations at Ocean Blue, so my friend and I arrived at the port at 10:50 a.m. (boarding didn’t begin until 11:00 a.m.), and immediately headed for the Guest Services desk. We were met with disappointment, as the fine dining establishment was already booked for both days. Determined to be a part of the Zakarian experience, we showed up Friday night in our finest garb and proceeded to convince Fiorella, the lovely hostess, to seat us outside for an early supper. The outside deck was a delightful dining area for a cool, breezy night. After I answered a few questions for Cruise Director, Julie Valeriote, during an impromptu live interview, my friend and I ordered some Pinot Noir and got ready for a dining experience to remember. After ordering appetizers, we were moved inside to the most prominent table in the restaurant, what a treat! I wanted to share my incredible experience with you, by detailing the wonderful cuisine I was able to try at Ocean Blue. This starter breathed new life into a summer classic, the Panzanella salad. More of a seafood caprese than a summer salad, it featured lightly fried cubes of grilled prawn, soft kalamata olives, and juicy heirloom tomatoes soaked in the aforementioned vinaigrette. Refreshing, tasty, and unique. The ribbon-like texture of the delicious beef tartare and the tart mustard dressing contrasted with the crunchy kettle-style potato chips for a lip-smacking combination. 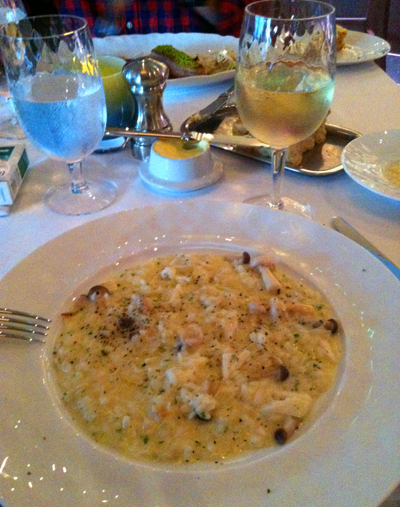 A delicious main course: Risotto of Jonah Crab/Mushroom/Parmesan Reggiano/Olive Oil which was promptly devoured. As you can see from the picture above, this dish was masterfully done. What you may not know is that the incredibly cooked al dente rice was the perfect opposition for the creamy Parmesan, mushroom, and Jonah Crab mixture. 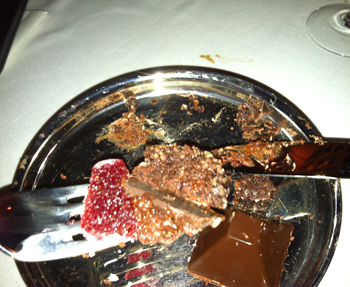 A bit of delicious Sea Salted Raspberry Paté, Chocolate Cookie, and Dark Chocolate Truffle, my dessert at Ocean Blue. Unfortunately I dove headfirst into this final course without stopping to take a picture. The fruit was a firm yet jelly-like texture and complimented the rich dark chocolate truffle and crispy cookie. The sea salt really made the dish though, offering a contradiction to the rich and deep chocolate and raspberry. 10 out of 10. That being said, we really got the five-star treatment. The service was perfectly balanced between attending to our every need and allowing us the space and time to enjoy our cuisine. After being moved inside to the main dining room, the view of the surrounding area (678 Ocean Place) was fantastic, and the atmosphere was calm, relaxed, and full of cheer. To top it all off, Geoffrey made his way to our table towards the end of our entrees. He was a consummate gentleman, discussing the intricacies of the menu and experience before courteously excusing himself to put his children to sleep. I strongly suggest reserving this specialty dining venue ahead of time if you are booked for a Norwegian Breakaway cruise in her inaugural season. Geoffrey Zakarian’s Ocean Blue was all that I hoped for, and so much more. Have you had the opportunity to dine at Ocean Blue, or are scheduling it in the near future? Comment below and tell us what you thought of the restaurant, or which of my dishes sounds the most delicious! Note to self- don’t get too excited by the Chocolate Dessert and attack it, then later remember to snap photo for blog! Looks great overall though, definitely checking out this joint when I sail with them to Bermuda later this year. Matt–the glistening sea salt is almost too alluring on the dessert. It was fantastic. I’m sure your trip to Bermuda will be a great experience! I disagree with a 10 out of 10 for Ocean Blue. First of all the price-$49 is way overboard. The appetizers ran from excellent (beet salad) to terrible (fried calamari). The portions on the entrees were small. There were three scallops and two pieces of pork belly. The monkfish was perhaps a 4oz. piece with about two tablespoons of forbidden rice. When one of us complained about the fried calamari being all greasy batter with small pieces of squid, the waitress actually argued that it was done correctly. I advise to avoid the very expensive specialty restaurant. Mitchel – Sorry to hear about your experience at Ocean Blue. I never like to hear that a cruiser received poor service and had a lackluster experience, but thank you for sharing. Unfortunately, I didn’t have the opportunity to try any of the items you mentioned, so I can’t compare. I will say though, that each night the experience is different, so I hope you haven’t lost your hunger for specialty dining. I would definitely recommend giving Ocean Blue another chance, trying some different dishes, or trying a different specialty dining option such as the Teppanyaki experience. Also, yes $49 is on the higher side for specialty dining, but I like to think of the fact that if I went to one of Chef Zakarian’s restaurants in New York or Atlantic City my bill would probably be double that. Here’s to hoping your next cruise dining experience is better. Just got off the Breakaway and had the Ocean Blue experience. Ours was fantastic and delicious! We enjoyed the calamari (some people will always complain) and everything else was amazing, especially the bread that was served. I think it was a rosemary, cheese, and sea salt concoction that was so yummy that we had to make ourselves stop eating it so we could enjoy the other courses! Sure wish I could get my hands on that recipe! Really glad to hear that, sounds like we’re on the same page. The bread was great! I was remiss in not mentioning it–whenever you have to ask the waiter to take bread away, you know it’s superb. What did you enjoy for your entree? Donald, glad you enjoyed their tea! 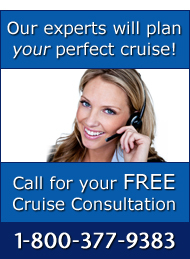 I reached out to Norwegian Cruise Line directly regarding your question, so I’ll keep you posted. i look forward to to finding out. I celebrated my birthday at the Ocean Blue Restaurant, everything was delicious. The desserts were so good and also I love the bread so much that I requested another serving. How can I get the recipe of this bread? Thanks.